Generous cleaning openings for easy cleaning from the front. New bus control design with Lambdatronic S 3200 micro-processor control. Carbonisation gas extraction system for “smoke-free” reloading. Hot cladding for efficient combustion without a build-up of tar. 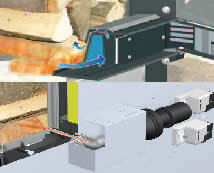 Large fuel loading chamber for pieces of wood up to half a metre in length enables long reloading intervals. Automatic heat up with special air ducts for fast heat up (optional: automatic ignition device). New combustion chamber shape for the lowest emissions through a long combustion zone. 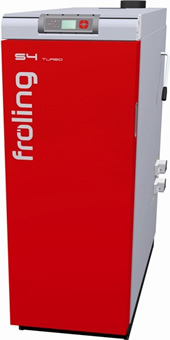 Froling’s new firewood boiler (15 – 20 kW) combines all the features of a state-of-the-art biomass combustion system. The speed-regulated induced draught fan ensures constant high quality combustion and the carbonisation gas extraction system prevents flue gas from escapin, even when topping up. The new S1 Turbo stands out for its high efficiency and long refilling intervals, combined with low emissions and low energy consumption. The new air duct concept in Froling’s S1 Turbo firewood boiler automatically regulates the heating air, primary air and secondary air with a single actuator. Thanks to the special air ducts for heating up, the fuel loading chamber door can be closed very soon afer lighting. Heating with firewood can be that convenient! Load the boiler, light the fuel, close the door and that’s it. No smoke is produced in the boiler room. If you like ease of operation, you will love the automatic ignition device. Heating with firewood can be so easy! No smoke escapes during reloading.